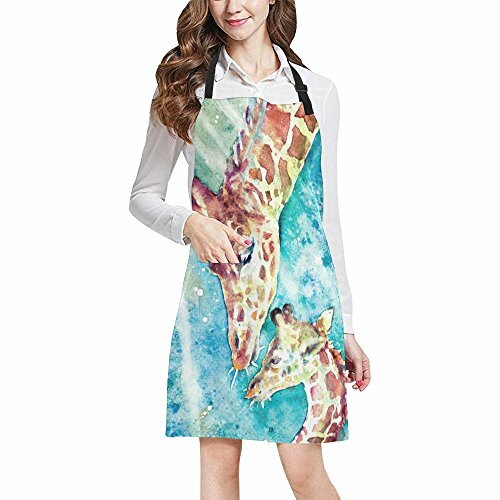 You've just a discovered an awesome stylish all over print adjustable apron for cooking, baking, crafting, gardening, which is cooking, baking, crafting, gardening, BBQ serving and workers. It will help you look gorgeous even when you work. It is also a great gift for anyone. Made of 16*12 twill (100% Polyester), soft and comfortable texture. 27.56"(W) x 31.50" (L), with adjustable straps to warp around neck and waist. These kitchen aprons can fit perfectly to everyone from women to men. Two front pockets, give you a place to hold cellphone, meat thermometer, grill slips, a tasting spoon, a cooking thermometer, a pen & paper for noting the recipes. 1.All Over High quallity print. 2.Securely packaged & shipped to protect from damage. Our apron will be securely packed to avoid possible damage. If you have any query,complaints or suggestions about our product quality, after-sale service or work efficiency, please contact us, we guarantee the prompt response within 5-20 hour with substantial action. HIGH QUALITY MATERIALS: Made from 16*12 twill (100% Polyester), soft and comfortable texture, durable and easy to clean. Machine wash, cold, tumble dry on low. ADJUSTABLE DESIGN: 27.56"(W) x 31.50" (L), with adjustable straps to warp around neck and waist. Our large apron can be easily altered to fit most sizes. PRACTICAL PROTECTION DESIGN: Two front pockets, perfect for cooking, baking, crafting, gardening, BBQ serving and workers. This apron is also can be as a work apron in commercial restaurant, cafe,nail shop ,beauty shop,kitchen, hotel etc. BUILT TO LAST: Image imprinted using heat sublimation technique to prevent discoloring, long-lasting effects. CONVENIENT & A IDEAL GIFT: It is in unique design and high quality, this apron fits both men and women. Everyone will love their look in the home,Coffee Shop,Bar or Commercial Kitchen. It will also be ideal gift choice for friends, family members. lover or colleagues ¨C be it a festive occasion or a casual gift.